Kicked off the official start of Fall with a beautiful 55 degree day. 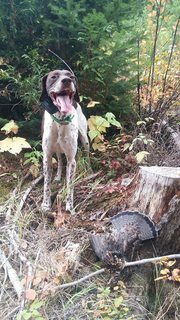 It rained overnight but quit by dawn, and with overcast skies, it was a good morning to load Rowdy up and chase grouse. We hunted hard putting in lots of miles at various elevations. We found a total of 3 ruffs in 24 dog miles covered. 2 were pointed and 1 wild flushed. 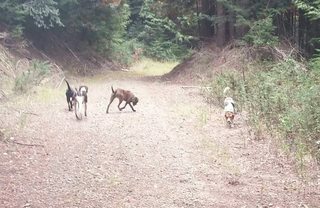 Rowdy and I were also joined by 3 very nice hounds who hunted with us for 5 minutes or so before taking off ona spur road on their own, each wearing a Garmin GPS collar. Leaves are starting to turn yellow, orange and red... tamaracks starting to turn too. 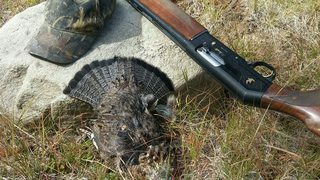 Ruffed and blue grouse on the mind... it's a good time of year. Ah to be on young legs following a birddog in Idaho. Bet the air smelled great. 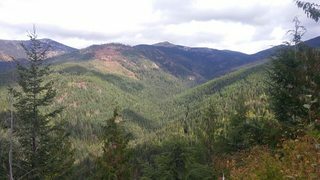 I love getting out in the woods and hunting forest grouse. But you are right Averageguy it can be a work out. So far the pup and I have bagged 2 Ruff’s and 2 Mt. quail. He pointed a grouse last weekend, but it flushed and I never even saw it. Gonna get after it again this weekend, I’m hoping the rain holds off. Nice! I appreciate the opportunity to live vicariously through you and the hounds. Keep it up. Good job Eric and Rowdy! Still waiting on fall here, well fall temperatures anyways. Hot and dry conditions making things rough. Supposed to cool off substantially this weekend. Keep up the good work boys. Great pics and a great time of year to be out. 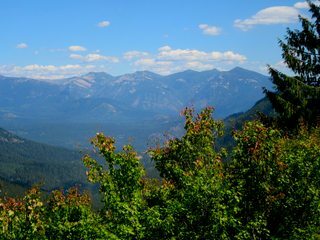 When I see other peoples pics of far off mountainous places I wonder what makes a man inflict such misery on themselves. Then I have to sit at my desk thinking of those places I have never been longing to inflict that misery upon myself. This might be our last full week in the 100s. Summer is loosing it's grip. LongHammer wrote: Great pics and a great time of year to be out. When I see other peoples pics of far off mountainous places I wonder what makes a man inflict such misery on themselves. Then I have to sit at my desk thinking of those places I have never been longing to inflict that misery upon myself. This might be our last full week in the 100s. Summer is loosing it's grip. Every year I fell more and more humbled by effort and beauty that hunting has provided me. When I first joined Vdogs and my good Griff was in her first year, I’d post pictures of the country we hunted and the flatlanders really got an eyefull. Eric knows where I’m talking about. They’d also kid me about packing that heavy A-5 over the rough terrain. Well, that’s where the birds are and the A-5 is like an extension of my body. Good combination. A gun is heavy only if you think it is.